I’ve spent a lot of time thinking about what best to sew for the momentous occasion that is both my husband’s 40th, AND the first weekend away without our daughter since she reluctantly allowed herself to be dragged into this world (at 42+1 weeks, I might add). 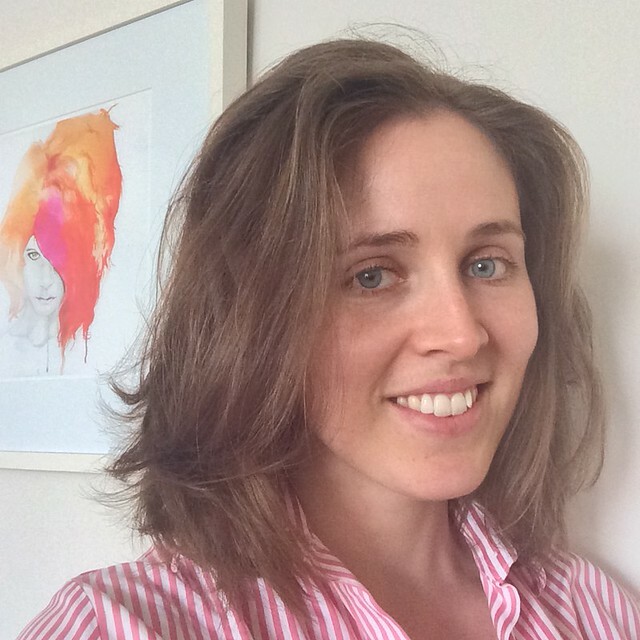 I definitely feel like my style has changed since then – certainly, I have changed – although I’d no better be able to describe what my style is now than before. Lately I’ve been feeling adventurous – in my imagination at least – and there is definitely an itch building to try a new to me style, to make a new-to-me silhouette work. I suspect this has originated with the wide leg pants thing going on, this new style having long since entrenched itself in mainstream fashions (goodness knows I’m no early adopter in this space). Or perhaps it’s a newfound and not-at-all-unpleasant insouciant mindset towards my body. 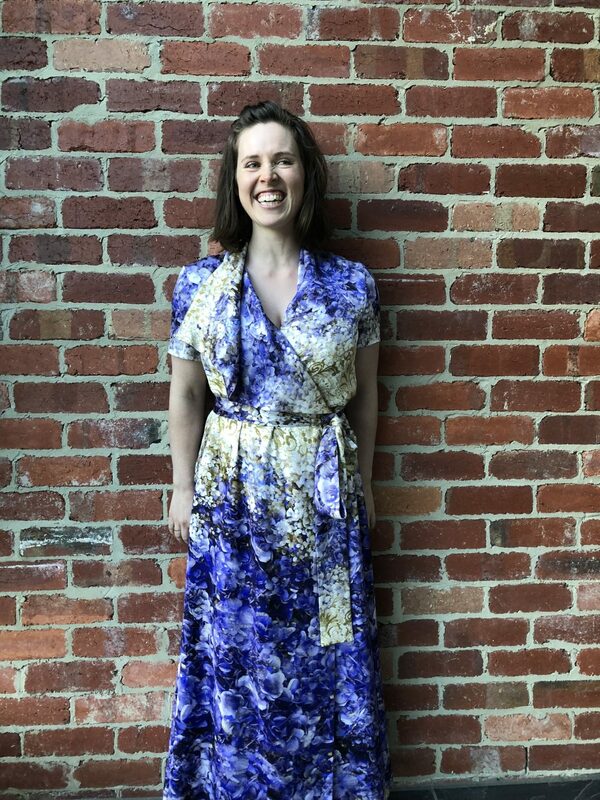 The Named Pattern’s Keilo wrap dress I just made was a tentative dip in those waters, and one I’m really very pleased with. Another very recent moment was trying on Sarah’s Ogden Cami, a pattern that I had completed written off due to the expectation that those lines would just look ridiculous on me. But, I found myself REALLY liking it. Back when Trent and I first started dating, we did one of those whirlwind trips away – last minute plane tickets with Tiger Air to Alice Springs, picking up two spots from cancellations in a cheep-n-cheerful backpacker-style tour that involved sleeping in swags under the stars, allowing us to take in the sights of the Red Centre (Uluru, Kata Tjuta, Kings Canyon) over three days, a trip which overall probably costed less than the fabric used to sew this dress. There are some pretty spectacular Aboriginal artworks up the Top End of the Northern Territory, but in the Red Centre, not so much. Our very passionate and knowledgeable tour guide (worth their weight in gold!) asked us to think about why that was so… It was a simple matter of resources. Food was plentiful and easy to come by up north so they were able to devote time to developing the creative and story-telling culture – expressed also via art. Not so much out in the desert. Basically, I’m somewhat akin to a southern Aboriginal person in this sense – there isn’t enough resources (time, in my case) to really explore this to the extend I would like to do. And there are still so many gaps in my wardrobe that I would like to fill with me-made, before I get to the real creative freedom part. So I’m making do with a small incremental change instead. It is definitely in the secret pyjamas category – this dress is essentially a bathrobe with daywear appropriate sleeves. It’s an amorphous kind of style, made even more so by the slippery charmeuse I made it from. 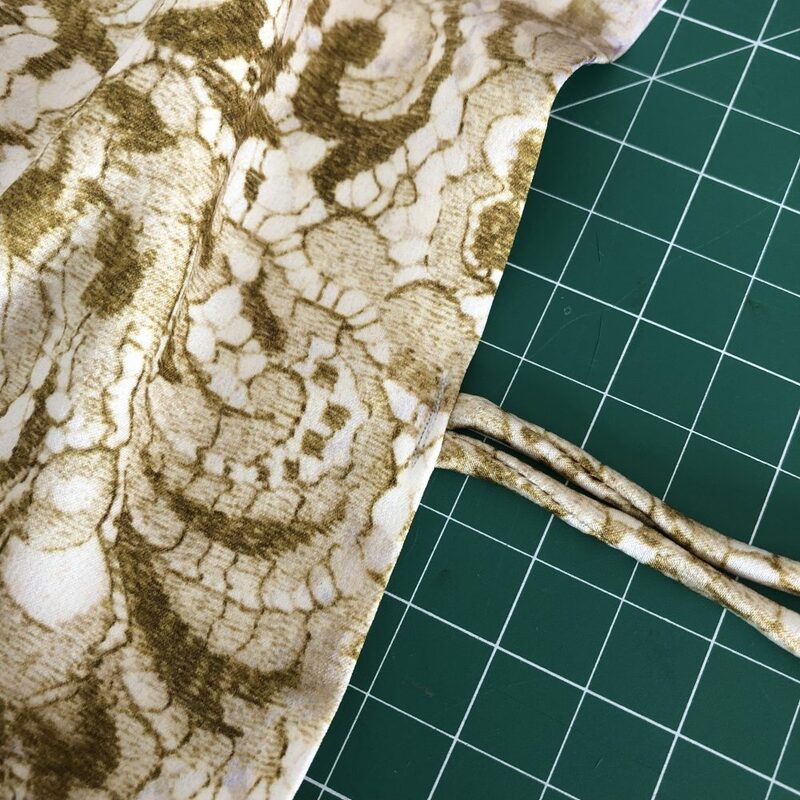 A very simple pattern to pull together – the hardest part really is wrangling those blasted giant tissue paper pieces to get the darned thing traced out. And then dealing with long pieces of slippery fabric., Vogue’s size 14 always seems to fit across my shoulders and bust decently well, so that’s the size I went with. There isn’t really much to fit, considering it is just a shapeless rectangular wrap dress with a belt tie to hold it together and give it some form. I did make a few minor changes though…. Like turning the gathering at the centre back into an inverted box pleat. Oh, and shortening it by 13cm. The dress itself is held together with not much more than the tie at your waist. 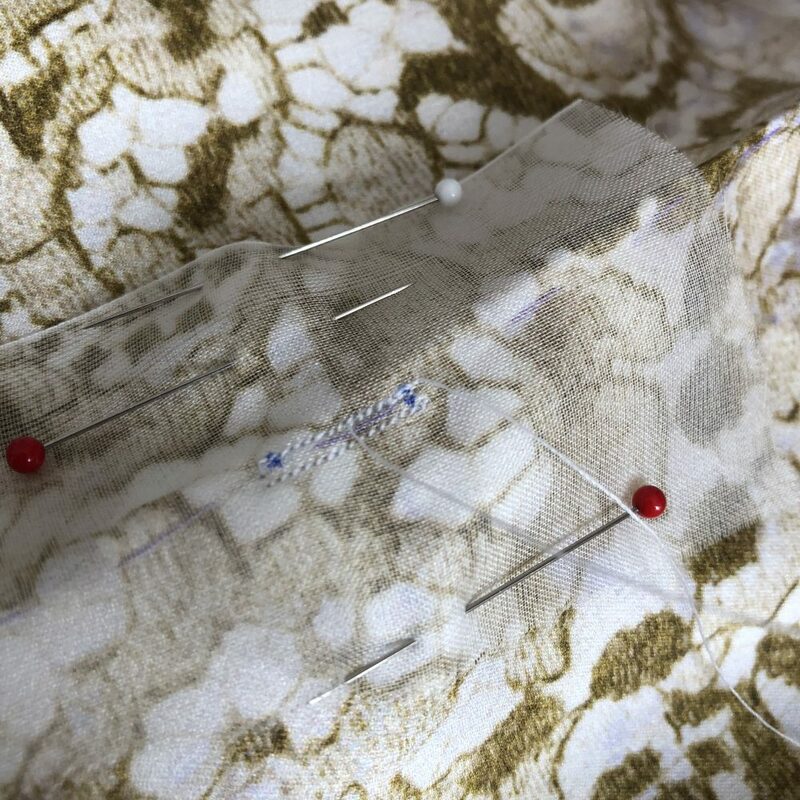 It has an ok-enough overlap between the front two pieces, and includes in the instructions a 1/4″ ribbon tie to secure the underlapping front piece to the opposite side seam. Instead of using the suggested ribbon treatment for ties – I made some spaghetti straps out of some bias strips from the leftovers – the same as those I made for my bias cami (any opportunity to practice a new skill!) 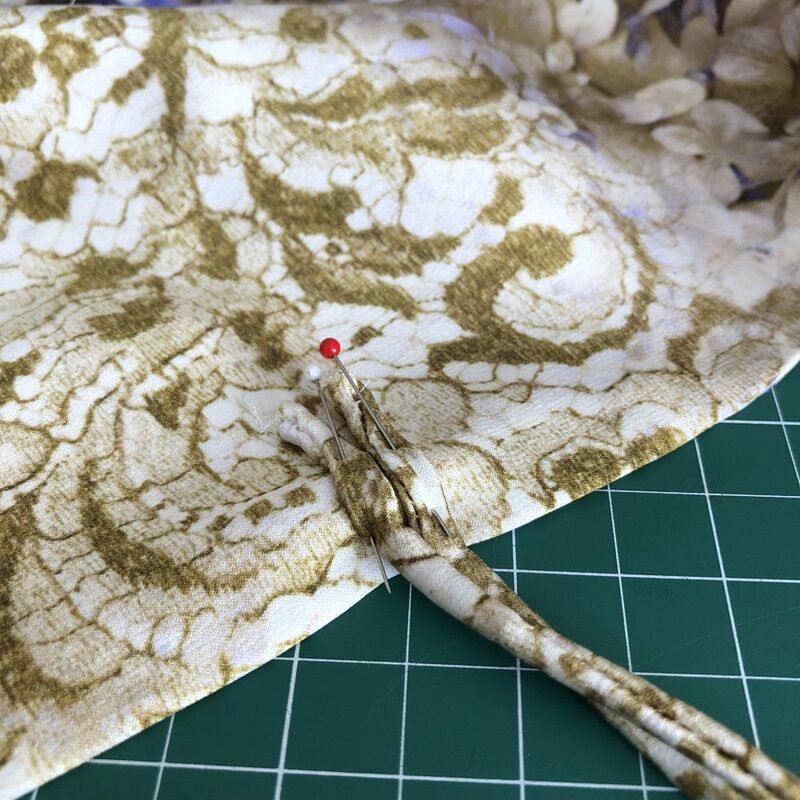 – and added in a loop at the waist on one side (worked into the French seam on the second pass), and corresponding two ties on the other side. This is hidden when wearing it as it’s underneath the overlapping front piece. … I ended up deciding on sewing a little window, and pulling the ties through it to hide the ends. And view from the front. 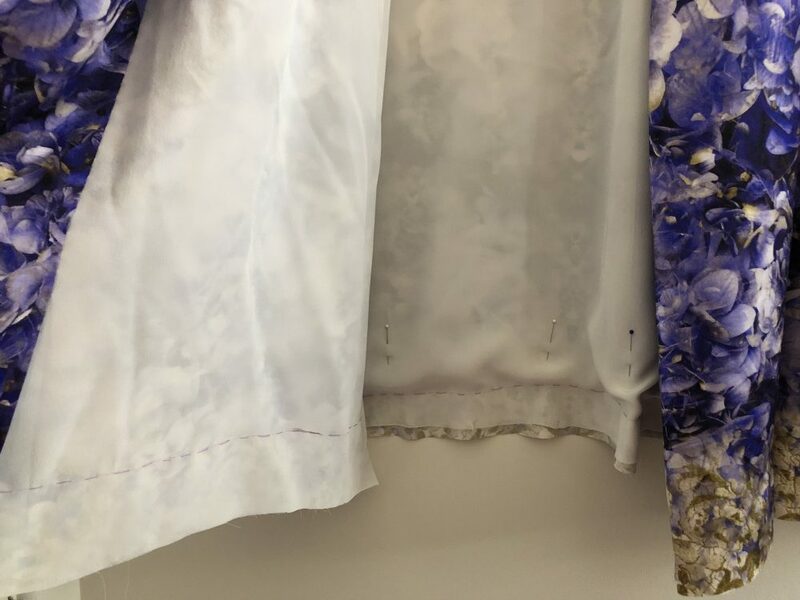 And to secure the overlapping front piece – I was originally thinking to include a lightweight snap, sewn in at the very edge of the facing, but didn’t get time to source one, and in the end – I prefer letting it fall where it may. It seems to suit the dress better, rather than trying to cajole and control. Even to the extent that the inner ties need to be tied loosely, else they distort how the dress hangs. 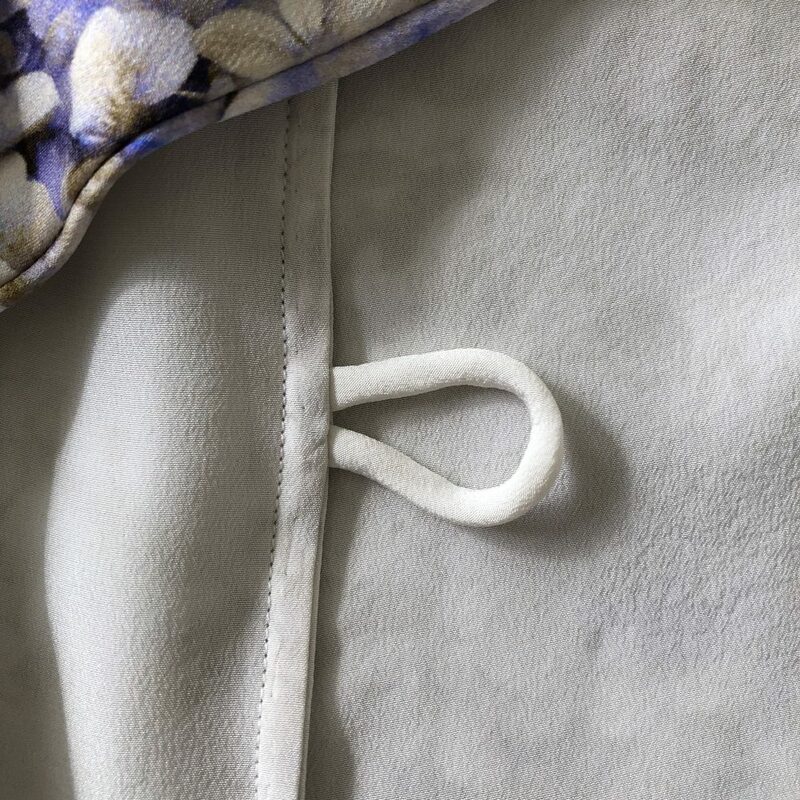 The hem is the usual treatment I seem to use these days – fold over, press and hand sew to the underlining. This is for both the hem of the dress, and the sleeves. The facings have also been slip stitched down to the underlining. 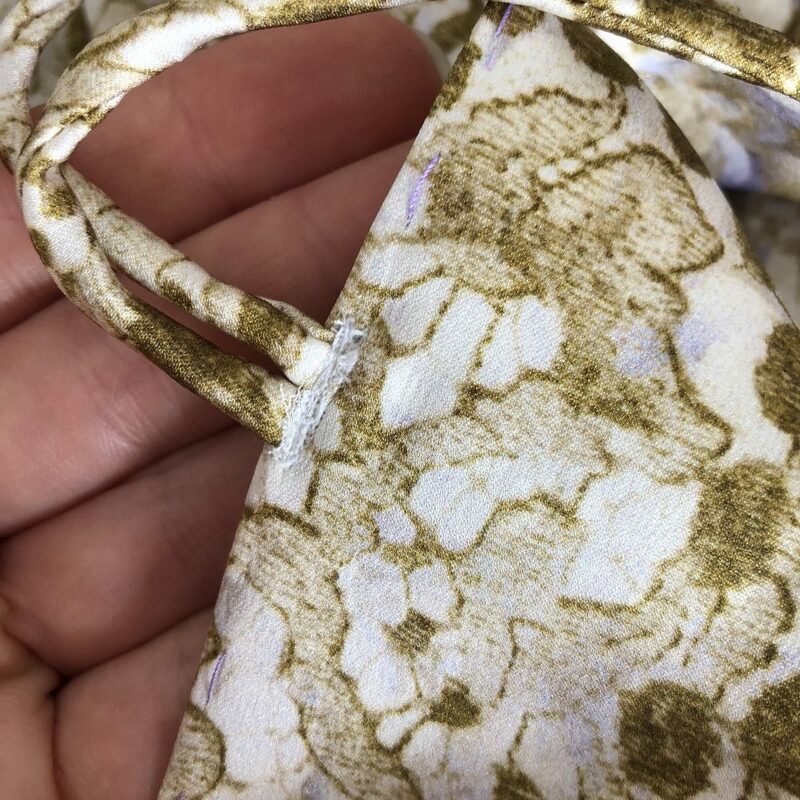 In order to make the underlining ‘work’ – I did take the long route of taking off the patterns 1.5cm seam allowance from each piece, and taking the time to threadbaste the underlining and the main fabric together as one. 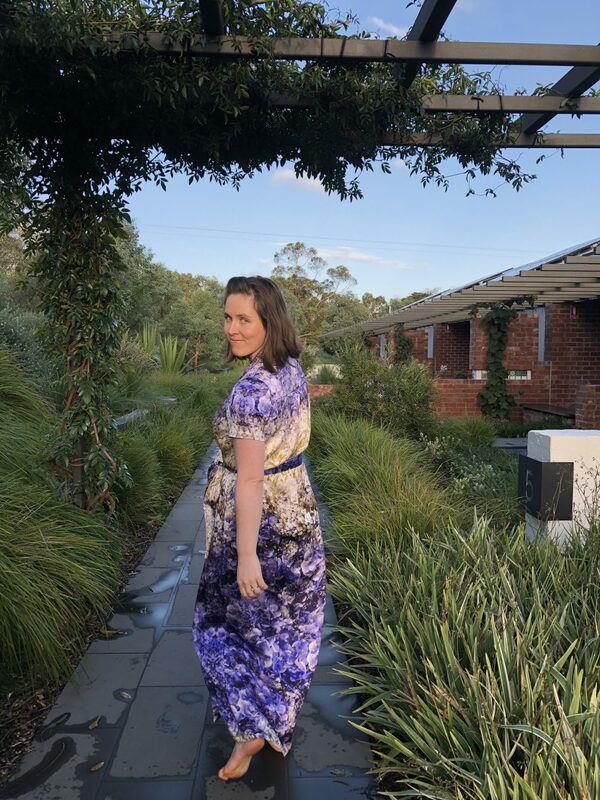 I’ve used the short sleeve option here (there is a mid and full length sleeve option also) to keep it feeling summery-, and I think it helps balances out with the length of the dress too. It’s the kind of pattern that can work for day and night, depending on your fabric choice – my favourites on the interwebs are by Heather Lou and Leisa. 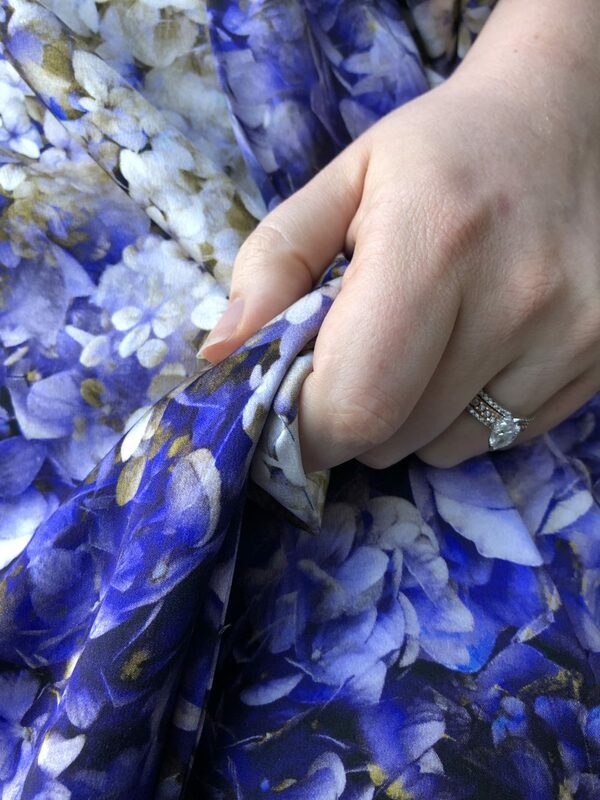 I think especially you can see on Heather’s beautiful dress how a lighter fabric works for this (ie – wonderfully! ), especially on that front flounce, which I believe benefits from a lighterweight fabric the most. I also am going to say that the slippery fabric I used does impact the ability of the tie to hold everything together – and that a grip-ier fabric like crepe de chin would be better for this. But, I’d honestly had my eye on this fabric – a floral silk charmeuse from Mendel Goldberg – for nearly 6 months. I kept putting off buying it, sort of hoping that someone else would snap it up and I would be lifted of the decision burden by default. And when I realised 2 months ago that I actually had an event to sew something lovely for and checked to see if it was still there… well! It’s a stretch silk, with 2% spandex. I’ve underlined it with my usual white crepe de chine, which obviously does negate the stretch factor. It also adds a lovely weight to the fabric which I love the feel of when wearing. 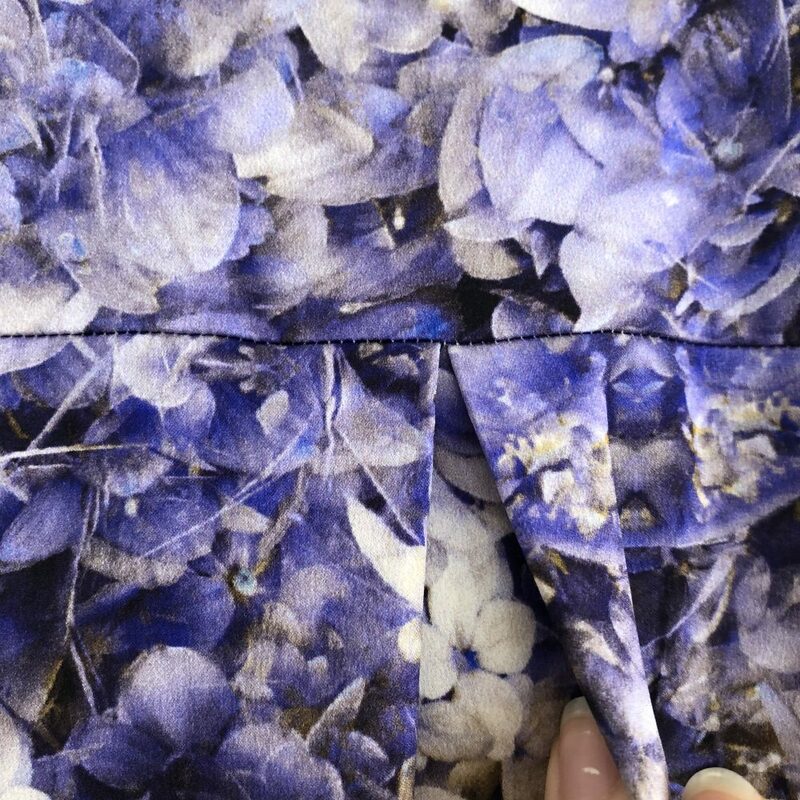 The print colours have incredible depth on this fabric… it’s almost 3D. But only at the back, not on the front pieces. I un-did the thread-tracing, re-pinned and re-thread-traced, and got on my way. 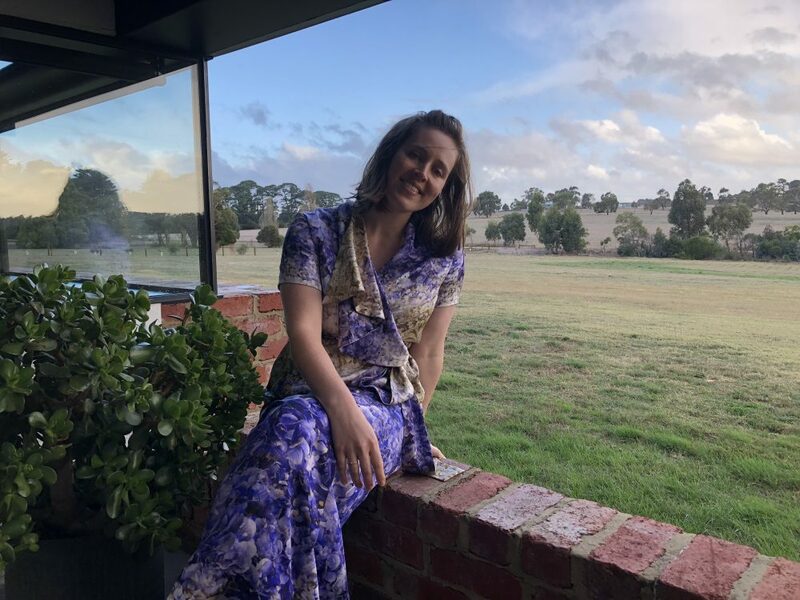 Of course, the weather decided to turn to winter over night – it was 13 degrees when we took these pics – but thanks to a handy thought from my mum, I was wearing icebreakers underneath and was really surprisingly warm. Spot the wool underneath! It’s a gorgeous dress and looks so good on you. I especially love the shading on that fabric, perfect! You look amazing in this beautiful dress, Mel! The fabric is fabulous and you were obviously meant to have it! I hope you had a wonderful time. Beauty and comfort, all in one dress! Perfect for a getaway! This is beautiful! I love the fabric. I think my favourite thing about sewing is the fabrics! Both stunning, and (I assume) incredibly comfortable. WIn win! Thanks Anne! It’s something I’ve been trying a few different avenues with – buying up large when my usual sources have sales, trying bulk sources overseas (the cdc under this dress was from Emma One Sock – thought I’d try their ‘silk solids’), and I’m currently investigating what is involved in buying wholesale. But, I haven’t landed on a sourcing means that I’ll stick with, yet! I’ve bought it in the past from Beautiful Silks, but since they’ve moved out of Fitzroy, it’s a little less convenient. Lovely dress! Love the word “icebreakers”! You Austratians have a great “language”! 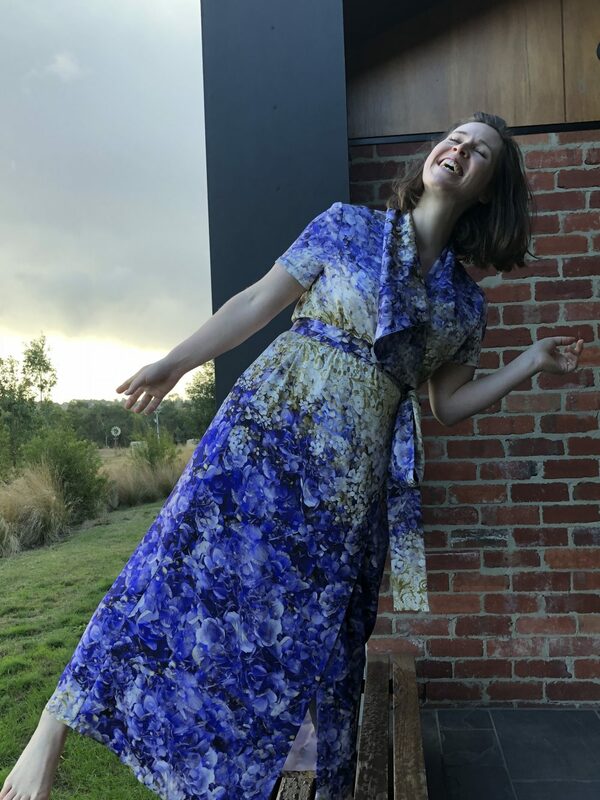 what a fantastic dress that is (and perfect match to that gorgeous fabric)! This is just beautiful! Have a wonderful time away. Gorgeous. 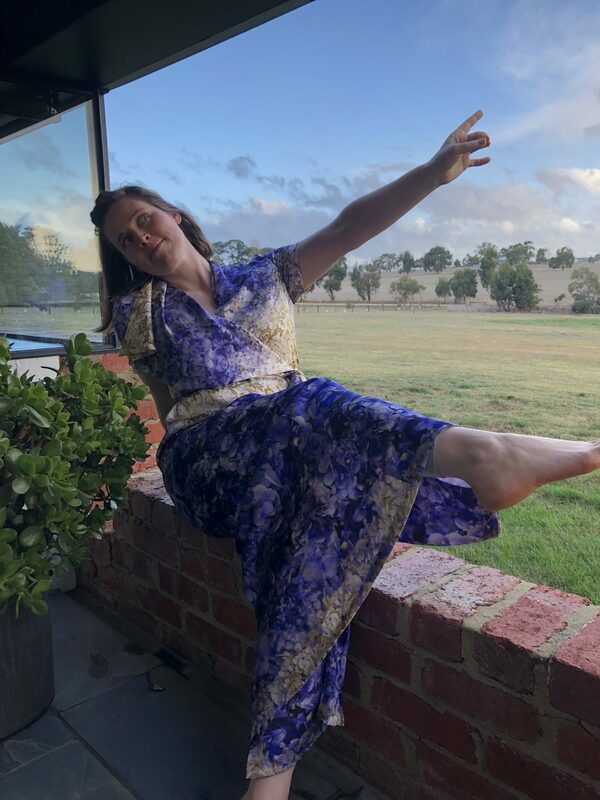 Hope you had a lovely time away but also glad to get back home too…..
so pretty – and great use of that beautiful fabric. Delightful! Your special weekend looked just perfect and the frock sublime! I’ve traced a different view of this pattern after seeing Jasika’s version. So chic! You could wear anything with your vivre de joie! Love our fabric. Appreciate that your style is changed for now. I would love to see how you look in a shapely but loose gored dress that flares out at the bottom and is short to the middle of the knee. You could wear three vintage insect/butterfly/bird pins. Do an optional belt that is corded on the sides with fabric that is darker than the main fabric. Make thread loops to place it where it is most flattering on you and never worry about arranging. (What am I thinking? Pins with a baby? Just wait on that. Make free-form fabric flowers out of darker bias tubing. No pins. You could wear anything with your vivre de joie! Love your fabric!!! Appreciate that your style is changed for now. Perfect for your trip. For next project, I would love to see how you look in a shapely but loose gored dress that flares out at the bottom and is short to the middle of the knee, cap sleeves. You could wear three vintage insect/butterfly/bird pins. Do an optional belt that is corded on the sides with fabric that is darker than the main fabric. Make thread loops to place it where it is most flattering on you and never worry about arranging. Simply stunning! And I loved the pics of your home. Such a stunning dress and your insta photos of your weekend looked amazing. 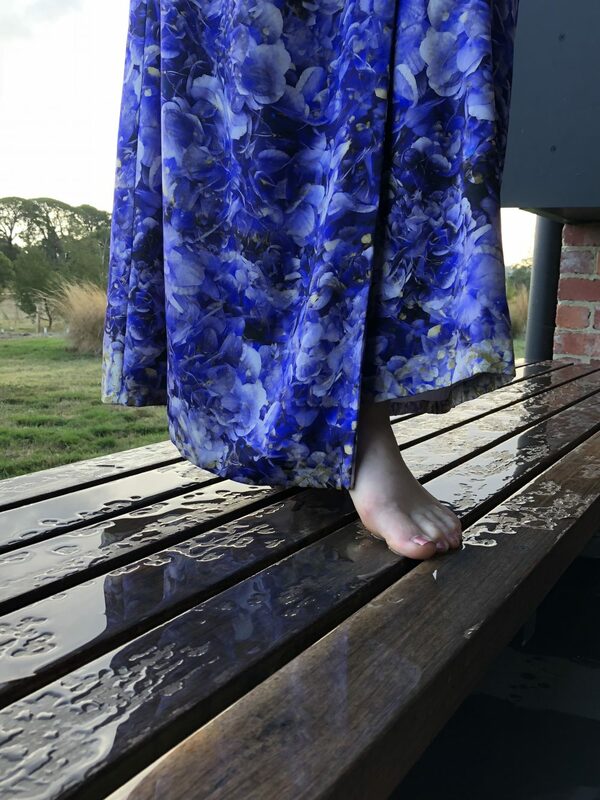 Sometimes stepping just outside your comfort zone is enough to give you that element of freshness, so keen to see what you sew next. Stunning fabric and equally amazing design. One would never guess you must have been freezing. It’s nice to enjoy time alone but I’m sure you were happy to return home. Ohhh this is gorgeous, Mel! I love how the lines of the dress really let the print take the front seat. The change of ties to the spaghetti straps is such a level up – it looks so polished! And go the ice breakers! 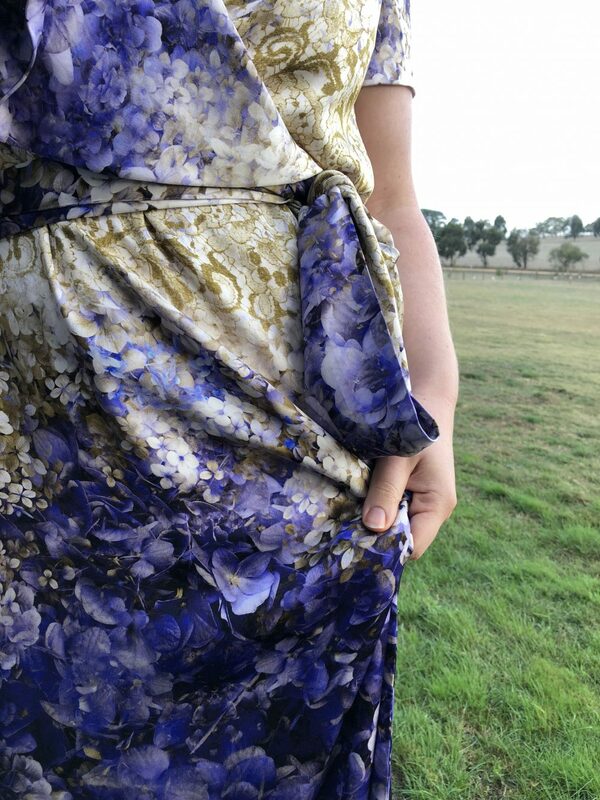 I have done the same thing with a long frock before as well – so snug!